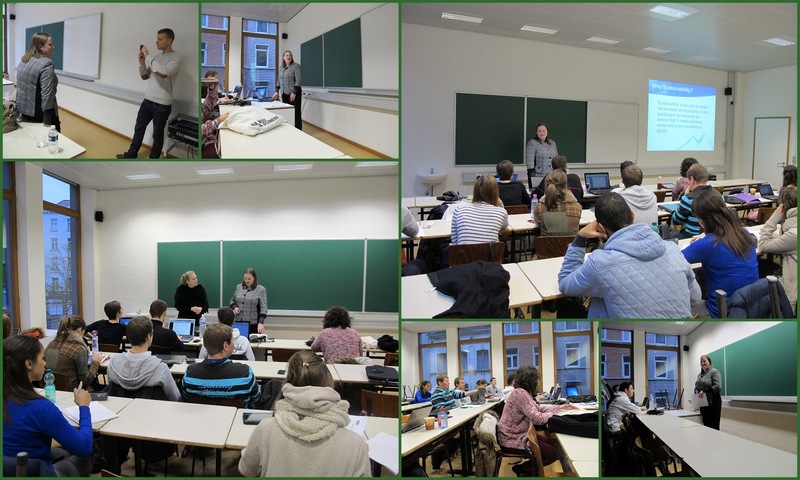 This morning, I gave a presentation to third year Communications Management students at the Erasmus University College in Brussels. My brief was to introduce these predominantly Flemish students (and three Erasmus students from Majorca) to the Brussels bubble and the work that we do helping trade associations communicate. The difference between public affairs and public relations and the world of lobbying were part of the presentation, as well as some case studies of our trade association work. We also talked about the challenges and the skills needed to be a successful trade association communicator. Diplomacy, intellectual curiosity, drive and determination come top of my list for communicators to thrive in this environment. It was my first time guest lecturing to university students so I wasn’t really sure what to expect. It’s certainly a different audience to our usual one of business people, NGOs and journalists but it’s one that fits well with our philosophy at Sustainability Consult to share knowledge where we can. This is often done as one-to-one meetings or interviews or guest speaking at conferences and training courses but helping prepare students for the world ‘out there’ is something I really enjoyed. The session reinforced the divide between Brussels, i.e. the EU bubble and the rest of Belgium. I was showcasing the work of policy-oriented trade associations which takes place just a few kilometers from this Flemish university but it couldn’t have been more alien to the students. As a communications practitioner, it’s an honour to be able to share our experience with the next generation of communicators. I hope to have chance to go back and address some other subjects with these bright young things. And naturally, I mentioned our internship programme! One student filmed a video clip with me at the end on why it’s important for young people to gain international experience. We’ll see if we can get the clip but I basically said that it broadens your horizons and makes you more attractive to employers. I doubt they need any encouragement but hopefully they will also consider EU communications as an option for their future career.